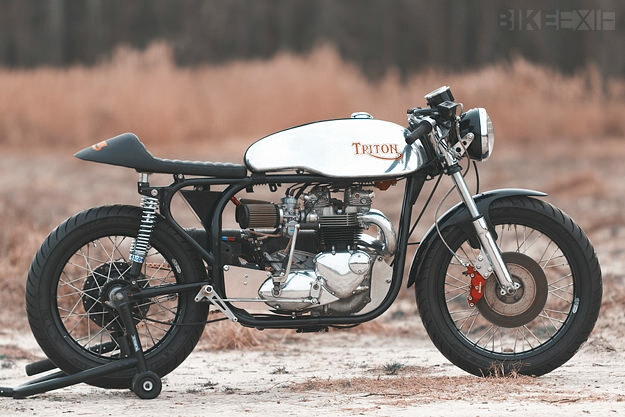 This lovely Triton is the latest from Loaded Gun Customs, the Delaware-based shop run by Kevin Dunworth. The story begins with a phone call from Dunworth’s tattoo artist brother, saying that the owner of the Baltimore Tattoo Museum wanted a Triton built. 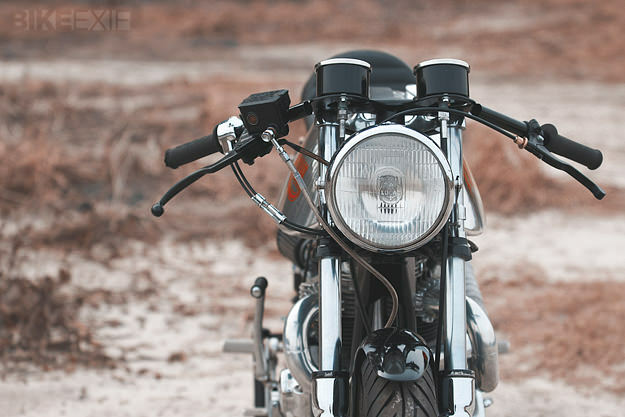 The starting point was to be an engine built by Arno St Denis, a legendary name in vintage Triumph circles. On went a set of Atlas triple trees, and Commando fork legs, with a Commando hub laced to 19” anodized Sun rims by Buchanan’s. A matching 18” on the rear is laced to a Triumph conical hub. The engine went into the frame using Loaded Gun’s own Triton conversion plates. (“We like to tilt the engine just a bit more than some of the others on the market.” Mikuni carbs and beautifully flowed intake manifolds release the full Arno St Denis magic, which includes a lightened crank and dynamic balancing. The motor is around 830cc, Dunworth estimates, has had a port job, and is running 10:1 pistons and a modified valve train. The seat pan was hand-made by Dunworth and sent to Florida for finishing. “I wanted to give a nod to the Manx style, but get her tail up in the air bit, Euro style. 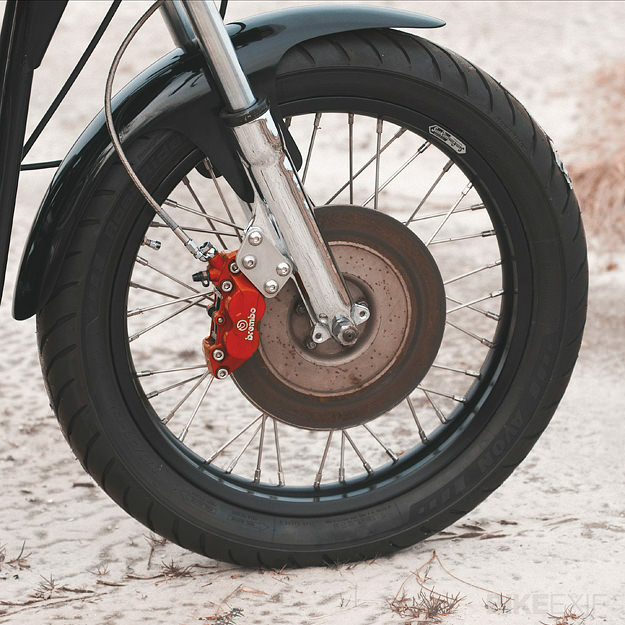 The cro-mo bars are from Lossa Engineering, and a Buell master cylinder operates on Brembo brakes stolen from a wrecked Ducati 916. 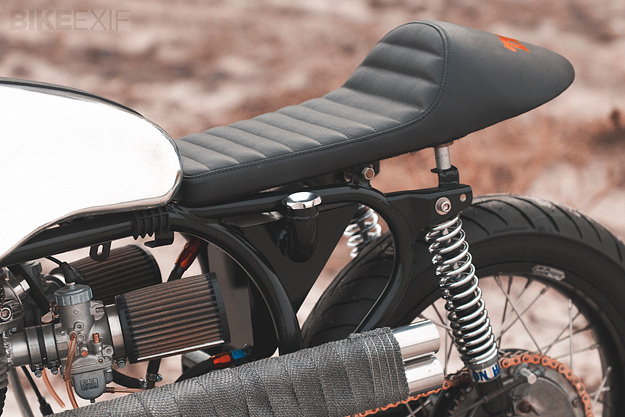 Hagon shocks fill out the back, the cloth-wrapped plug wires are from NYC Choppers, and footrests are taken care of with Loaded Gun’s own rearsets. The grips are super-sticky Ariete GPs. 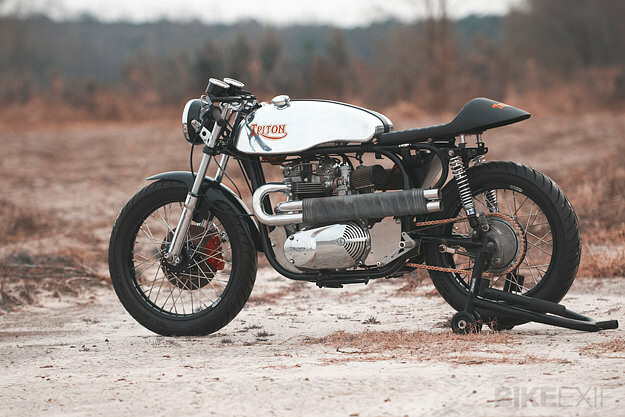 The Triton is now Chris Keaton’s daily rider, used on the streets of Baltimore and the surrounding country roads, so Dunworth left much of the finish ‘raw.’ “The bike looked old and ridden as soon as we finished it.” And all the better for it, we’d say.